What were a tube radio with a dark round hole instead of a nice green shining tuning eye! Many types are hard to obtain and are also expensive. Having spent a lot of money for a tube there still remains the limited life expectancy. - When I switch on my radio then the new and expensive tuning eye wears out - The joy is damped! These considerations lead to the development of a clone. Inside the original bulb with the original base an electromechanical part is located. 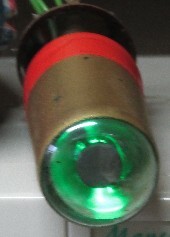 From the front side the original reflector and cap are visible. 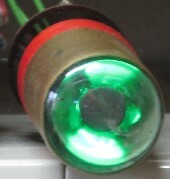 The light source is a modern LED. Control is done with a microcontroller. The segment size continuously changes according to the control voltage. All round types can be replaced.